On the face of it, there is not much to celebrate. Wastage of resources has become acute. We seem to be in an era of energy-guzzlers. But things are not that bad if we scratch the surface a bit we can find rising sensitivity in urban areas on use of water, energy, or the way we manage our waste. That is good news--the kind that has not been reported for a very long time. Consider the numbers. In the last six months or so, the country's Green Buildings Council received green certification applications from building projects on around 3,700 hectares. It is so easy to turn cynical and decry this effort. But the fact that mainstream business, that destroys so callously, has finally changed colours is a positive development. It has turned around to seeing that it makes market and business sense to go green.A lot of the business initiatives might not fit in with standard definitions of ecologically-sustainable development, but they still make for heartening news. The number of people in urban areas in the world exceeded those in rural areas for the first time this year. It's quite a startling development 2 per cent of the world's landmass produces nearly two-thirds of the current gdp, has 55 per cent of the world's population living in it, and consumes 75 per cent of the world's natural resources. It's quite significant that this 2 per cent of the world's landmass will dictate fortunes of the rest of the world in the next 100 years. 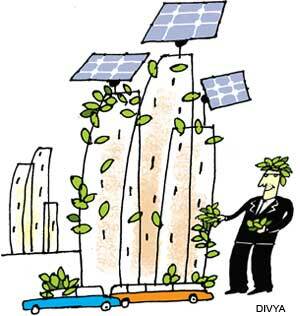 The good news is that we have the technologies to make sustainable cities. Many of us, even in our fifties, might see sustainable cities in our own lifetimes. I think that is good news enough for sustaining 30 years of dedication. Let me narrate an incident related by an architect. He got a client's brief to build something that would last 400 years. The architect instantly figured that he could not build with steel and concrete, for he knew it won't last as long. Urban India is finding solutions that help you produce and consume within communities, townships and small towns. Let us take a simple example. A city like Bangalore can reduce its electricity consumption by 300 mw if a million people in its residential apartments replace geysers with solar collectors. Allow me to give another example if all the wet waste in a 200-home township is treated to make for organic compost, it can enrich the land around such tracts. This is significant because soil in urban areas is slowly dying due to lack of rejuvenating nutrients. The interest in tapping local resources is not exactly new for a thousand years, probably even more, people consumed locally produced commodities. Of course, there was trade. But that served the needs of the rich--trade was not the cornerstone of life, local production was. Today many find that ancient practice is relevant again. But will our markets rise to the occasion? This is a challenge that India is beginning to take seriously. That's good news. It is easy to be overwhelmed by such initial interest. We should be careful. Success needs to be carefully nurtured. Risks need to be examined and people need to be aware of what it takes to secure the outputs that business, and buyers, are looking for.